I am having problems finding the right spot for the dashcam I received for Christmas. It’s an Aukey and I’m using the suction cup mount so it is not as streamlined as ones that are just wedged shaped and mount right to the windshield. Since the Niro has the big housing in front of the rear view mirror, I can’t mount it so that it is partially hidden by the mirror. And if I mount it as close to the housing as I can, the housing partially blocks the view of the wide angle lens. My best bet seems to be putting it on the passenger side next to the mirror so that it minimizes how much it blocks my view out the front and also minimizes how much the housing is blocking the camera’s view. Just stick em on. Think I have enough? Are you 3D mapping your daily drive? lafe005 and Nouseformonkeys like this. Ahh...that makes sense. I also just realized that I have to put on the Sunpass sticker on the windshield for the electronic tolls payments. I've had mine professionally installed, but placed where I asked. The wires are all tucked away, and the rear cam looks even better than the front. I'm pretty tall, so the front placement was only as annoying as having all that bulky gear that's already attached. Oh, and here is the field of view for both cams. Placement seems pretty good. Your set up looks really sweet. I was debating about getting a rear view camera as well but decided it was going to be too much of a pain to install the wiring. I bought a base that attaches to the rear view mirror stalk so the the dashcam can be centered. I also bought the wiring kit so I can power it from the fuse box but I did not install it yet because it was getting late in the day and I didn’t want to do a rush job. Here’s a screen capture from my camera. Since it’s attached to the mirror base, it is set back a bit from the windshield and the sensor base partially obscures the top of the camera. But that doesn’t seem to be too much of a factor. You can see from the pic that the traffic lights are still in full view which would be the main thing you would want to capture at the top if you were in a crash. Unless, of course, a helicopter landed on top of your car! Last edited by Nouseformonkeys; 01-07-2019 at 06:42 PM. 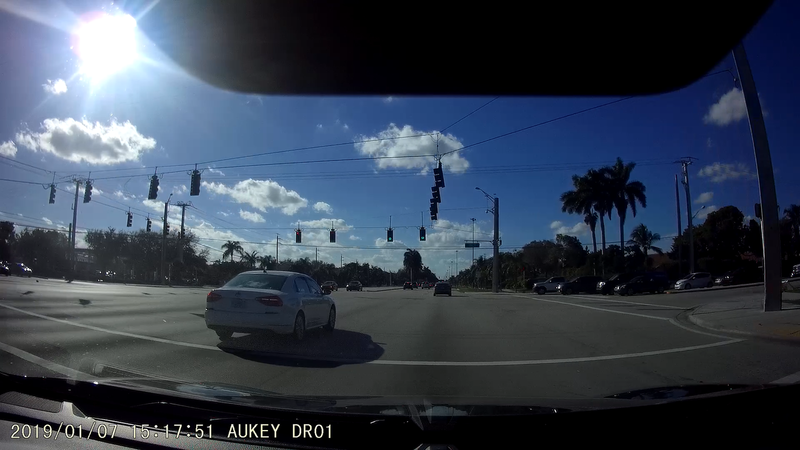 I have a front (Rexing 4k) and rear suction cup dash cam in my Niro, and they have already saved me from a traffic ticket and being charged my insurance deductible for a not-at-fault collision. The front one goes to the right of the mirror, and the USB cord I routed above the head liner and through the door frame seal into a console USB adapter. It's mounted on a modified toll responder mount with super glue. The rear cam wire has two USB extenders also plugged it the front console adapters, and the wire is hidden under the trunk, side seat and floor plastic parts.